I'm looking forward to see your nylon palace. It will be an interesting tent show next month. Last week I tried my new tipi in the Delftse hout. 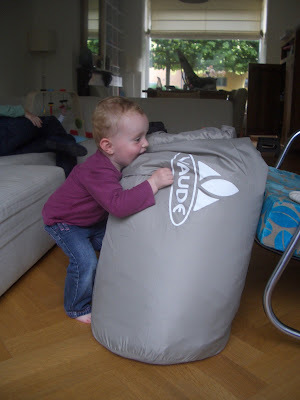 if you think the Vaude is a faff to put up and the weight a bit excessive you ought to try my family tent. I have a Vango Aspen 700 DLX. Its huge and weighs in at a hefty 65kilos. Most of the tent is double skinned but....wait for it.....pitched inner first! Not a tent for anyone under 170cm! Thim: Looking foewards to it. Hope you've reserved a quite corner of the field far away from decent folk! Dave: 65 kilos? I'm new to this family camping buisness I never knew tents could weigh as much as a wife? You've made me feel much better about our choice. Its an excellent tent mind you. Its just that you pray for no rain when putting it up as its a 45minute job!